I have to say, as this blog gets more and more popular, it's getting more and more difficult to stay anonymous on my pizza reviews. Take today for instance. I called in my order ahead of time to dine in, then I pulled in and got out of my car to take my customary picture of Vince the Pizza Prince's storefront and was immediately caught! I didn't know what to say other than I wanted to send my buddy a picture to prove I was here, which technically wasn't a lie, because I have hundreds (hopefully one day millions) of "buddies" that I wanted to send the photo to along with this blog post! Anyway, I regrouped and was happy to see that my pizza was fresh and hot ready for me to eat, which was great because it was about 7 degrees outside! I entered the small dining area and was greeted by a couple of very friendly employees. I'd call this more of a takeout joint, rather than a dine-in, but this definitely got the job done for me. Since you can see the entire kitchen from the counter, I could see that the dough was pre-pressed out on pans to proof ahead of time, and that American cheese was definitely going to be part of the equation of this pizza, and that's just as I remembered it when I had Vince's many years ago. 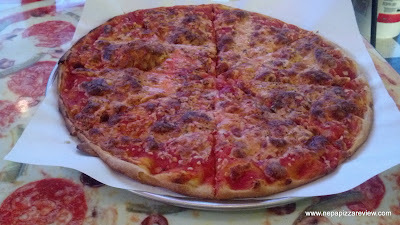 When the pizza came out, it looked just as I recalled with the darkened cheese on top, plenty of sauce, and a thin crust. The American cheese was relatively lightly applied, but plenty to cover the pizza. I really enjoyed the amount of cheese, because it allowed the flavor of the sauce to shine through, but if you are a cheese person, you may want to consider extra cheese. Speaking of sauce, it was applied fairly generously, and expertly spread right out to the edge. The sauce was also the unique component of the pizza which distinguishes it from others in the area. The peppery sauce (think Maroni’s) is so tasty, and just works perfectly with the cheese and crust. The crust, which was quite thin, was cooked to absolute perfection. It was crispy on the bottom, consistently stretched, very tender and flavorful. I have to add that I enjoyed the seasonings sprinkled on top, and the Parmesan under the cheese was the perfect complement. Overall, I had nothing but good things to say about this pie, and I very much enjoyed how different it was than the many others I’ve had in NEPA. I highly recommend Vince's, not only because it's good, not only because he's been around for a million years, but because it's something a little bit different, and really stands out against the rest of the 570 pizza landscape. It's a long way from my home in West Chester PA, but I'd love to try it. Would have liked to see a pic of the crust underside -- it reveals a lot about the dough and the skill of the pizzialo. Keep up the good work! I'll tell you, it's worth the trip up for Vince's along with a ton of other great places that we have in the area. Good suggestion on the bottom of the crust, I've done that a few times on some of my older posts but I haven't made it a staple in my blog posts. I'll be sure to incorporate that a little more. I have been eating Vince's Pizza since I was a kid. I am 62 y/o now. I was eating it when the original Vince was making it. To me it is a staple. It is the best pizza around.